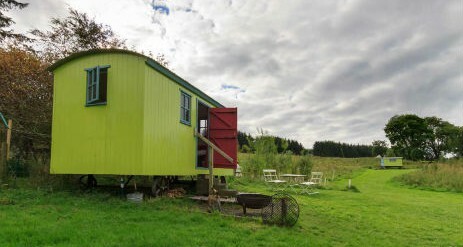 Ecocamp Glenshee is a sustainable glamping site situated amidst stunning mountain scenery and beautiful rivers in Glenshee, Scotland. There is an abundance of fabulous walking for all abilities from forest tracks to the isolation of Glen Taitneach as well as Munros in the Cairngorm National Park and Highland Perthshire. We are surrounded by great cycling for both roadies and off road and are within 1/2 Alyth Bike Park. We are 20 minutes from Glenshee Ski Centre and two minutes from the nearest ski and snowboard hire. We have the Shee Water, Black Water Ericht, Tay and Isla all within easy reach for both canoeing and fishing. 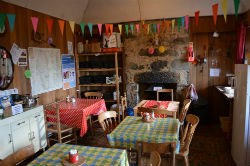 The Bothy, is our communal space, we provide all you need for cooking, eating and drinking. There is a fridge freezer and storage shelves for food. We provide 2 camping stoves. There are sofas, a wood burning stove, books, maps, toys etc! Its also where we serve breakfast if you have pre ordered it. 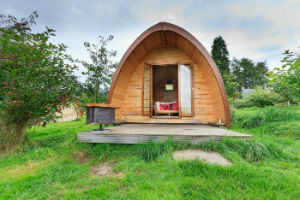 We have three lovely Wooden Pods which are available all year round. 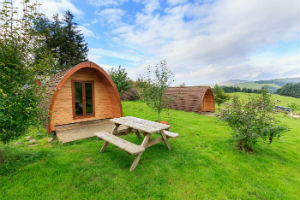 Pods have all the comforts that make camping simpler in our increasingly unpredictable weather and are a great alternative to camping with young children or out of season. 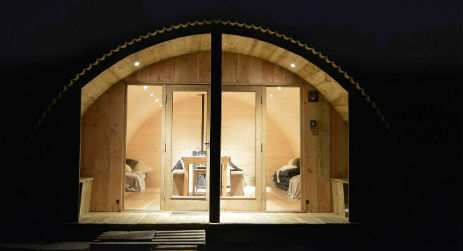 Think of your Pod as a warm, heated, secure tent. Even in deepest winter you won’t be cold our Pods are well heated and thoroughly insulated. All you need to provide are your own sleeping bags or duvet and sheets! You can enjoy the spread stars at night sitting around your own fire pit under our dark skies. This is a quirky llama-inspired funky space for 4! 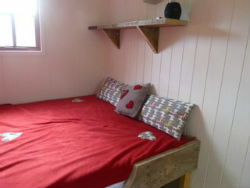 The Hut has a double bed supplied with linen, towels and organic soap and two single beds provided with pillows you can bring sleeping bags or we can supply them at £2 a night. The hut is heated with a wood burning stove. There is crockery, tea, coffee,or hot chocolate all Fair Trade. The hand made table is crafted from North Sea oil platform scaffolding planks. The shepherds hut has electric lighting and we have supplied you with some quirky books and games to keep you entertained whatever the weather! Welcome to our new addition THE HOWFF. Perfect for a get together with family and friends! 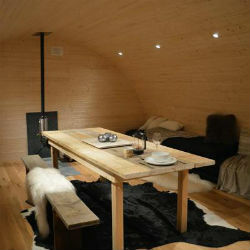 The Howff has a huge amount of sheeps wool insulation, plus a wood burning stove to keep you snug. Floor to ceiling windows afford stunning views of Glenshee and the Cairngorms. There is a basic kitchen, with camping stove, crockery and cutlery pots and pans. The Howff sleeps 10 comfortably, it comes with 10 thick mattress’, pillows and fleecy blankets, all you need are 10 sleeping bags or you can rent them, £2 a night. Our Authentic LMS Goods Wagon c.1941 was rescued from a farmyard in Aberdeenshire is now ready as our newest accommodation. It has been given lots of TLC and a post war British Rail train theme including carefully sourced period pieces. 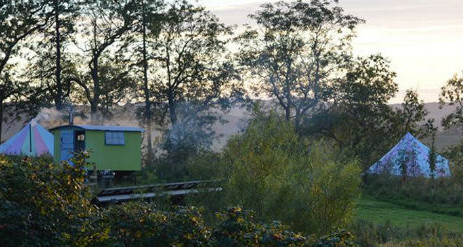 This awesome addition to the Ecocamp family sleeps 5. 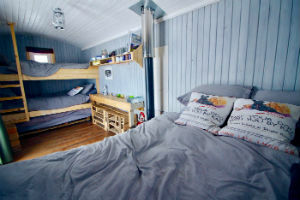 The comfortable interior includes a double bed with bed linen and 3 extra wide bunk beds all made up with linen, seating and bench table and double doors that open onto open fields and the Glenshee hills. Read the story of it’s restoration in our news section. The walls are packed with recycled insulation so its very snug. We have used water based varnishes and colour washes over the wooden walls and the wooden floor is reclaimed from a Victorian era factory. There is a wood burning stove and an external fire pit with out door seating to soak up the dramatic views. 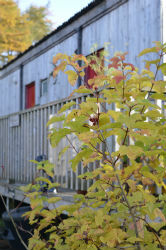 Our re-vamped toilet block is a very short stroll! The Romantic version of our Wooden Pods for couples. 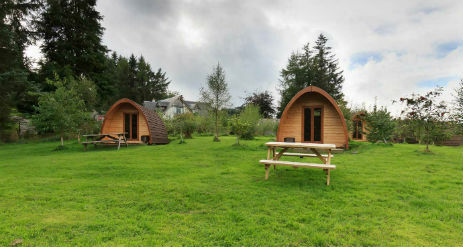 We have 3 Romantic Pods each with their own outdoor seating and fire pit. 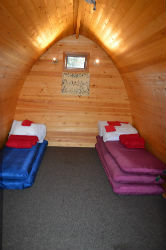 The romantic pods have double beds with memory foam mattress, crisp cotton sheets, towels and organic soap. With eclectic bunting and lots of cushions and comfy seating its a perfect retreat for two. You also have your own Fair Trade tea, coffee and hot chocolate with kettle! Always wanted a romantic get away from it all with a bit of luxury….here we are with our own bell tents for two. 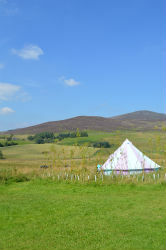 Our Bell tents are situated overlooking the stunning panorama of Glenshee. Our bell tents are built from the finest quality materials to ensure your comfort throughout your stay with a multi coloured canvas. Your bed comes complete with a memory foam mattress and crisp bed linen all ready made up for you!. 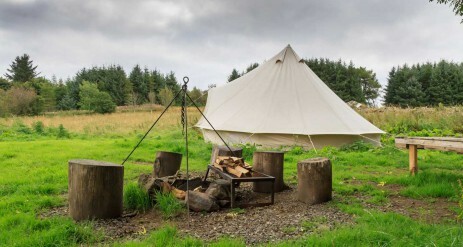 Each bell tent comes with its own interior wood burning stove, outside fire pit as well was internal and external seating and lots of fun ethnic decor. This accommodation is off grid and has Led lanterns and night lights. 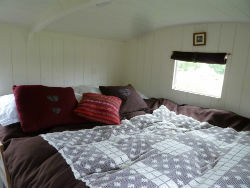 Our Shepherds Hut is a calm and tranquil space for two. 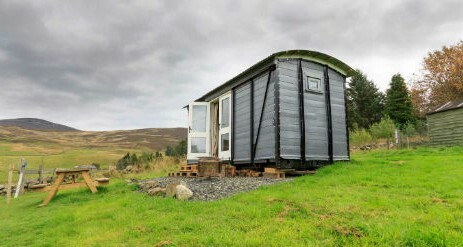 The hut is off grid to ensure a peaceful stay but supplied with plenty of solar and of course candle light… Its raised double bed will provide stunning views across Glenshee from your bed. The wood burning stove is guaranteed to keep you snug and let you boil up a brew or pre-prepared stew. 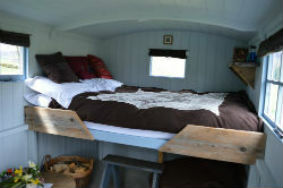 Under the Shepherds Hut are two chairs for you to lounge by the fire pit, star gazing, drinking tea, wine, bubbly and reading some of your favourite poetry… Our hand crafted bed, table and shelves are made from North Sea oil platform scaffolding planks, beautifully weathered by wind and waves. Our blinds are made from recycled tweed and fleece. The cosy bedspread incorporates a beautiful antique hand crocheted lace tablecloth. The cosy cushions are up-cycled woolly jumpers! Our Bothy is a warm, comfortable traditional stone building for our guests. You can chill out next the wood burning stove with a book from the novel bank. Perfect space for a party or family get-together contact us for exclusive lets. are heated and insulated so it’s cosy all year round, we have endless instant hot water from our energy efficient boiler. The Shower block and toilets are lit on the outside(low energy bulbs) all night. Hand towels are supplied in the toilet block along with hand wash and a selection of “left behind” shampoo! We can also rent you a large bath towel for £2. There is no charge for showers. We provide a range of breakfasts from homemade granola cereals and home baked toast with marmalade and butter, to giant rolls filled with locally sourced bacon, eggs, sausages or black pudding! We love our fluffy thick American pancakes or vegan breakfast platter. All our breakfasts come with lashings of free fairtrade tea and filter coffee! Packed Lunch can consist of large baps locally sourced filled with a selection of ham, cheese, home made hummus and salads in season, homemade scones (fruit, plain or cheese), home bakes, fruit and water, we are also happy to top up flasks with tea/coffee. We stock frozen Highland Drovers burgers and sausages. We also supply fire pits, charcoal and every thing you need for a roaring fire and great BBQ what ever the weather! When you arrive park in the lower car park. At night time-be warned – Blacklunans is a dark place, real, proper dark!! There is zero light pollution and our solar lights give off little light, but the night sky is stunning. Please bring a head torch ideally per person. The area outside our house (Reception) and the Bothy is lit. 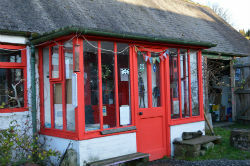 Come to the house and we will check you in and you can drop off your food in the Bothy in the crates and fridge/freezer. We will give you your key and show you to your accommodation. 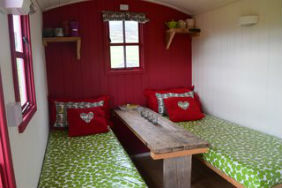 Please note glamping accommodation is off-grid and has no electricity, you can charge electrical items in the Bothy! Please note our advice reference accessing wildlife and walking your pets in the area.